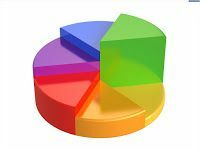 Charts and graphs are effective tools to convey information in a simple and visual way. They're also a great way to track trends and help explain complex datasets. Following are my top favorite sites for creating a chart or graph. Lovely Charts - A easy site to use to make very polished charts. While not free, there are three paid versions to choose from, such as: iPad, online, or desktop. Bonus - Useful Charts - While not a chart creation tool, this site has some of the best-looking charts for every subject. Also, laminated charts can be ordered for the classroom.